This entry was posted on Thursday, June 15th, 2017 at 12:22 pm	and is filed under Computer Games, Computer History, Gaming History, Regular Features, Retro Scan of the Week, Retrogaming, Vintage Computing. You can follow any responses to this entry through the RSS 2.0 feed. You can skip to the end and leave a response. Pinging is currently not allowed. I have never heard of this thing, very interesting. I have a TI-99, I might have to try and find one of these. 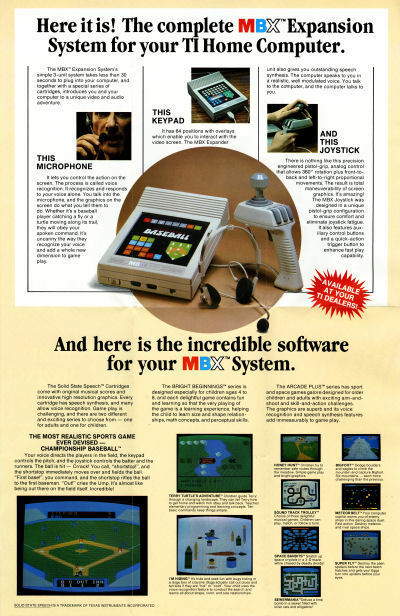 Trufax: The first time I used voice recognition was on an MBX unit at a relative’s house. It was, ummm, not so impressive once the novelty wore off. Except for sabotaging other people’s games by shouting contradictory commands from behind them. That never got old. Tangentially, I am PRETTY sure that source is very wrong about Milton-Bradley creating the TMS9918(or 9918a). Aside from TI being a technology company and M-B being a toy company, there’s the tiny little issue that the chip has a known development team, and they were TI employees. And, well, if M-B designed a graphics chip in ’78 and shipped half of a game console in ’83, they were REALLY bad at this. Especially since the ColecoVision used the same graphics chip, and M-B would have had a MASSIVE head start. There’s simply no excuse for them to have designed a graphics chip so early while ALSO being so slow to design a system. 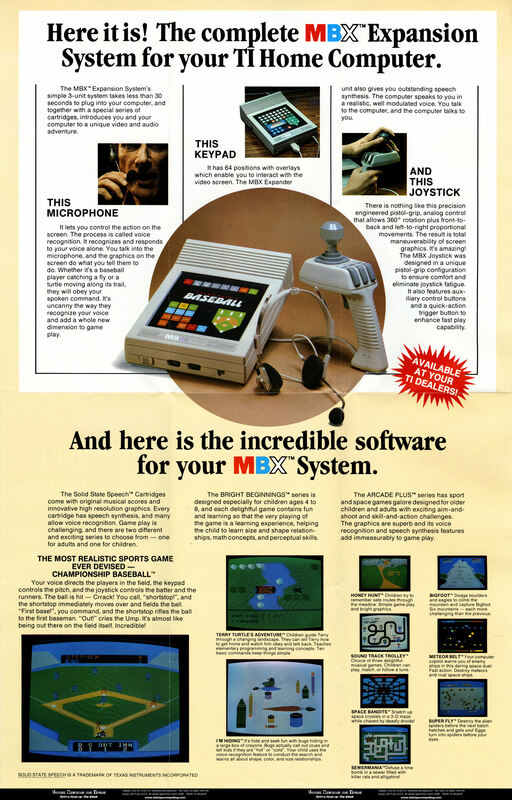 Though I guess launching the MBX expansion just a few months before TI shuttered the entire home computer division WOULD be evidence that M-B was really bad at this. There was an app bundled with the original SoundBlaster I purchased back in 1990… that was my first exposure. I actually had one of these! I believe the only game I had for it was baseball which I think is what came with it. It was kinda fun. The technology seemed really cool but actually playing it was okay at best. I thought the keypad overlay was interesting, like a huge version of the Intellivision controller. I haven’t even thought about this thing in decades. I was actually surprised to see you paste such a dubious claim, and assumed it simply slipped through the cracks. But I had to call it out anyways… and then I got a bit carried away there. Yeah, I’m usually very rigorous. I was just lazy this time and wanted to get it up quickly. Oh well — lesson learned! Very interesting. I had a TI99/4a, but I also had an Atari 2600, which is where all the gaming happened until we got the Commodore 64. Then the TI and 2600 collected dust. But I still have them. The headset (with the padded “ear rests”) remind me of the Access Software “Lip Stik” that was bundled with ECHELON, a 3d sandbox space sim that was reminiscent of Elite or Space Rogue but was set on a single world (a newly discovered “captured” planet at the edge of our solar system). The fire button was mimicked by the “microphone”. You had to say “fire” but honestly any loud noise would work; and indeed even without the lipstik you could put another joystick in port 2 and just use it’s fire button. I was sorely disappointed to discover that it did not in fact function as stereo headphones as well as the “voice fire button”. I used to have a Konami LaserScope (before I took it apart as a curious young teenager), which is a head-mounted light gun peripheral with built-in headphones for the the NES. Its gimmick was that you could shout “fire!” into its microphone to take a shot instead of pushing a button. That gimmick lost a lot of its appeal once users realized that literally any sound loud enough would trigger the fire function. So you could just blow into it or tap the microphone to shoot. 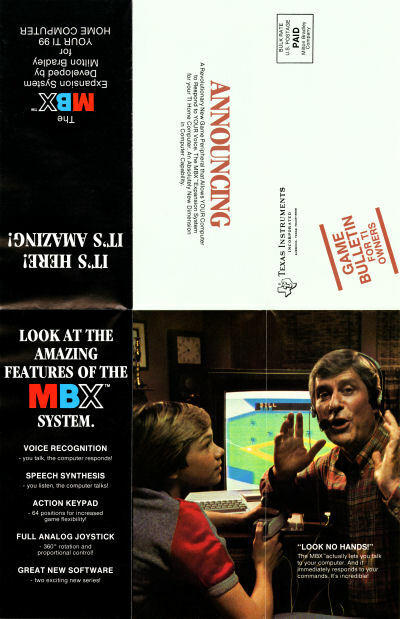 Regarding the MBX, the pamphlet does say something about voice training, but I would not be surprised if that is how its headset works as well — just a sound threshold that triggers a button push (this is pure speculation though — I really need to actually try it some day). And also, despite appearances, the headset on the MBX does not have integrated speakers. They’re just foam pads to hold the thing on your head. Yeah, Benj, that is probably the case (loud noise v. actual voice recognition, something that has only been practical since the late 1990s, in my experience). I always thought it was cheap of Access to not go the full bug and include actual headphones. I might have used the LipStik more if it had. And, I would imagine, the MBX might’ve had a bigger splash if it had headphones, too. 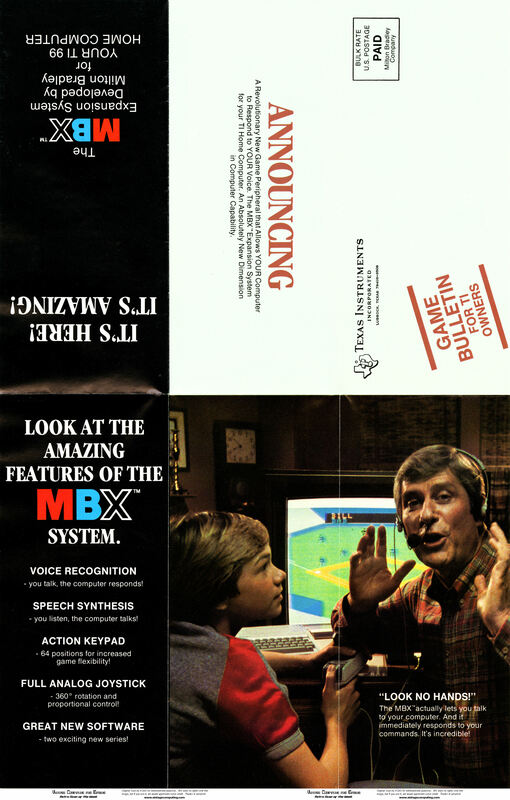 The MBX microphone is at least slightly more refined than “loud noise = button”, as it can respond to multiple unique commands within a single game. A fact I remember vividly because it was SO fun to walk up behind someone and shout left while he’s saying right, or vice-versa. There’s certainly not MUCH comparison going on, with limited processor time and RAM space being major obstacles, but there’s some smarts in there. Probably checking for a pattern of 1-bit spikes, but still… a pattern is better than just “fire”.